Liz and Lucille find out that someone has been accused of doing something they didn’t do. Can innocence be proven? Episode Theme: Fighting against gossip. 1. James 3:5 says, “Likewise the tongue is a small part of the body, but it makes great boasts. Consider what a great forest is set on fire by a small spark.” Have you ever made up a story about someone and then felt bad about it later? 2. In Joshua 7, you can read the story of a man named Achan. He was one of the Israelites who helped conquer Jericho. Achan disobeyed God by keeping some of the treasure from Jericho for himself, then lied about it to cover up his sin. God punished Achan severely because he hates dishonesty. Think about how being dishonest hurts God, others, and you as you listen to today’s program. In this episode, Liz and Lucille find out that someone has been accused of doing something they didn’t do. Have you ever committed murder? Probably not. But in a way, we all have—with our tongues. What you say to or about someone can destroy a person's life. Your words can permanently damage someone’s reputation. They can cause people to suffer for things they didn’t do. . They can take away a person’s motivation to work hard and accomplish the things he or she is gifted and called to do. In this episode, Charles lost 30 years of his life because of a lie, and because people gossiped about him, destroying his reputation and his life. Sometimes you might be drawn into gossip about a person because it’s a way to belong, to connect with others. It often seems easier to be negative than positive. But when we keep a tight rein on our tongues, we not only keep ourselves from hurting others, we please God, and we witness to others about walking God's way (see James 1:26-27). Want to dig deeper into what the Bible says about honesty? Read Proverbs 12:22, Philippians 4:8-9, and John 8:32. What is the name of the group that Lucille is studying for her social studies project? Who did she find listed as a member? Who is in prison for the fire that killed Mr. Squamata? 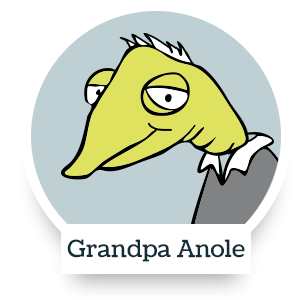 What is the key to telling Grandpa Anole and his twin brother Johnny apart? Read James 3:3-12 during your devotions. Talk with your family about the word pictures James uses here—a bit in a horse’s mouth, a big ship steered by a small rudder, a forest set on fire by a spark, a small part of the body that corrupts the whole body. The tongue is tricky: It can produce both good and evil. Who can tame the tongue? No person can—only God! Using biblical teaching, Kids Corner episodes, and activities, this ebook helps kids and parents talk about divorce. Small decisions make a big, big difference. When it’s right or wrong, you choose. This booklet can help you talk about bullying with your family and friends. Hear this song about God leading you today! Here's a favorite: What a Friend We Have in Jesus. Enjoy this Kids Corner version. How do you make good choices? Check out this song about doing just that! Don’t get puffed up or swell-headed. Just thank Him for His blessings. When the time is right, He’ll give you a chance to shine. Jesus told this story about who is our neighbor. How terrible is sin? Listen to the story of these two brothers, Cain and Abel. God sent a judge named Deborah to save the Israelites. Listen to her story. Needing courage, Esther is called by God to save his people. The Garden of Eden was a wonderful place where Adam and Eve walked and talked with God. What went wrong? It's not fair! Liz has questions about the money he earns, while Lucille questions a test score. It's time for some justice! Liz and the gang's Clubhouse Theater presents the story of Deborah. Who is she in the Bible? What does God want her to do? Granny’s valuable family ring is lost among 500 chocolate cupcakes. Can Lucille and Liz find it before someone else accidentally bites into it? A bully is bothering Scooter, but what can Liz do about it? Liz and Lucille want to win a big prize, and Linda wants a new romance. Is this happening or is it the end of the world? At the school play auditions, Liz acts like he's the star of the show! Will Hollywood Liz have everyone standing in applause or will he bring down the house? When Liz, Morrie and Scooter do some snooping around in places they shouldn’t be, they discover clues to the mystery of the Blue Pearl. Who was the Blue Pearl? What does murder mean? Liz is sure that he’s never murdered anyone, but he needs some help figuring out the sixth commandment on this episode of Kids Corner. Liz is having a very bad, horrible week when he loses Grandpa’s antique coin, fails a surprise test, and gets a cold. Who should Liz choose: a Good Samaritan or the exciting Iguanas? Liz learns lesson in friendship and bike safety. It’s gone! Liz and Scooter have lost Grandpa’s prized baseball. Lies and cover ups or telling the truth? Pie baking for the Terrene Pies R Round Festival is interrupted when someone steals one of the pies. Who is the culprit? It's racing season, and Liz and Morrie join pit crew #55. But soon a car wins under suspicious circumstances. Should Liz report what he saw? Scooter is determined to win the Terrene Go-Kart competition even if it means a little cheating. Grandpa uses the story of David and Bathsheba to teach his church school class about the 7th commandment and broken promises. One sin leads to another, and adventures quickly turn to nightmares. As always, little sins grow. Liz faces peer pressure and does something he know is foolish. What is the hardest thing to do? Liz competes in the TV reality show The Champion and finds out what needs great strength. School is upside down with both Liz and Skink both getting A's. 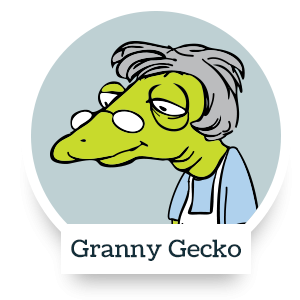 And why is Granny refusing to attend her high school reunion? Scooter is having a terrible time at school and decides he wants revenge. But before he gets a chance, what will Grandpa do to change Scooter's mind? Lucille is acting very weird, and Liz is on this case to figure out why. Who is jumping to the wrong conclusion?